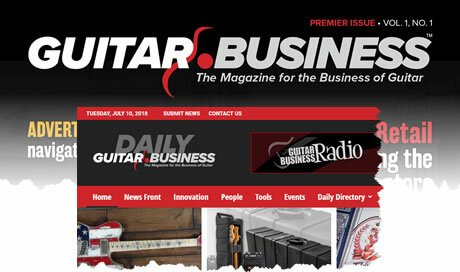 Our company name says it… Guitar Business Media. We’re all about the business of guitar in many forms, in many directions, from guitar builders to guitar players, CEO’s to entrepreneurs and everything in between. If you have a business or professional connection to anything guitar-related, our goal is to send value in your direction. Business media is a different animal. It’s not consumer media, but our readers are all consumers of information. So our mission is to provide valuable, useful and engaging content they won’t get elsewhere. So let’s get to it. Guitar Business is a fully produced, digital first magazine with a printed version ultimately available to paid subscribers and at special events currently scheduled to premier in later 2019. We are designing to take so-called trade publications to a higher level. Clean, modern lines, erring on the side of perfection is our preference. Our digital version is alive and fully interactive utilizing all the benefits digital has to offer. But wait, there’s more… So stick with us. And that’s just for starters… there’s more to come. But first things first. It shouldn’t surprise you that we’re interested in editorial contributors who seek a serious, but creative opportunity to display their literary aspirations, knowledge and desire to make a difference with something different. If you have a sense that Guitar Business and you might have something in common, fill out the form below and let’s find out. Filling out this form will get the ball rolling. No guarantees, but we’ll review the information and respond accordingly as quickly as possible. Tell us what you want us to know, or ask us a question or two... or both. Get important regular Updates on the magazine. You must check the box below to get the Updates.